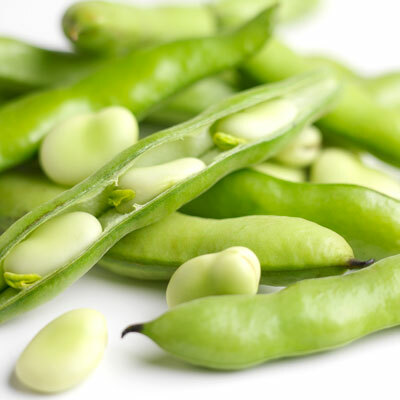 Fava Beans are bulky, light green pods that contain delicious, protein-packed beans inside. The peel of the Fava bean is indigestible and generally shelled to extract the flat beans inside. Shell the Fava beans by snapping the stem and pulling the threading seem downward along the length of the pod. To prepare them for a recipe, blanch them in boiling salt water for about one minute and immediately move them to an ice bath to stop the cooking process. From here, you can steam them until tender for use as a standalone side dish or add them to salads, risotto dishes, pastas, stews, and stir-fries. Try mashing Fava beans into a hummus-like spread and serve with crackers or bruschetta. Choose Fava beans that are fresh, even shaped beans that are a vibrant green. Avoid yellowing pods. Store the beans into a plastic bag and into the refrigerator. Always wash fresh produce before consuming.